Hunter has changed a lot in the past 12 weeks. He’s sleeping through the night, he’s much less afraid of trying new foods and he is able to focus on tasks and conversations without getting too overwhelmed or distracted. But Angie, Hunter’s mom, is most excited about what she says is the biggest change in her son: he’s happier. Hunter’s challenges make it more difficult for him to concentrate in a conversation, deal with a noisy environment or be around foods he doesn’t like. When faced with one of these challenges, Hunter would often get overwhelmed and have a hard time cooling down. Angie took Hunter to several different places for therapy, but they always left feeling frustrated and disappointed, until Angie’s friend suggested she look into ChildServe’s Neuromotor Intensives program. When they walked in to the colorful space for their first appointment, both Angie and Hunter noticed a clear difference. 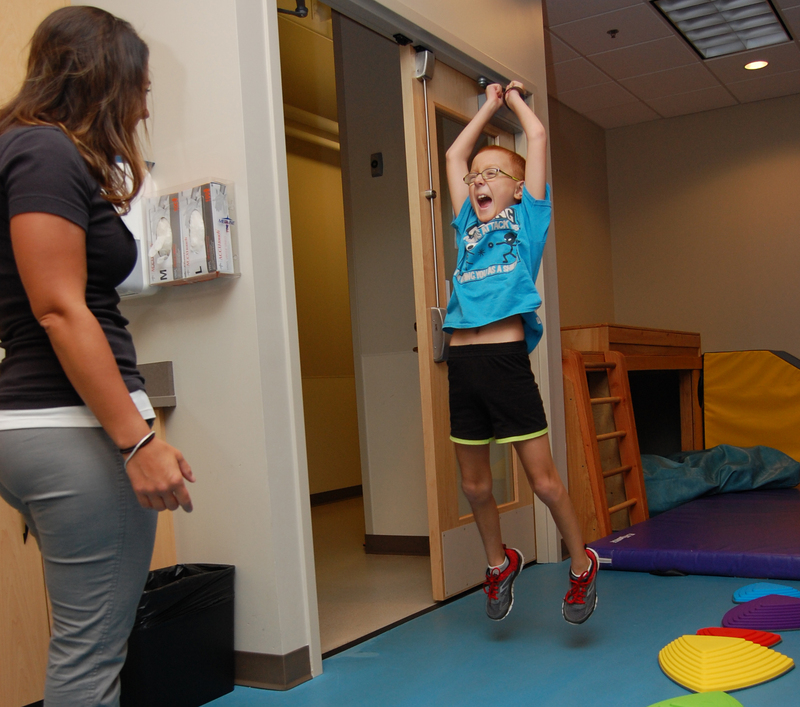 Hunter participated in ChildServe’s Neuromotor Intensives program, a 12-week program that focuses on helping kids build skills faster and in a fun environment. He’s been working with therapists Christine Weiland and Ashley Jobe on tolerating new foods, self-regulating his emotions and focusing on tasks. But the most important thing his therapists do is make sure Hunter knows that he has a say in what he does in therapy. Asking Hunter what he wants to do has been especially useful in his feeding therapy. Christine says she makes sure Hunter knows that he can tell her when he’s at his limit for the day. Since the beginning, Christine and Ashley have made sure therapy feels like fun. Hunter gets to run through an obstacle course, play with his food and ride on a swing, all while making meaningful progress towards his goals. This tactic worked for Hunter – he’s now comfortable starting conversations with other children by himself. His social skills have improved tremendously. But out of all the things Hunter has gained from therapy, Angie said her biggest gift was very simple – a hug from her son. As Hunter walked out of therapy that day, he told Angie and Ashley that now that he can tie his shoes, he can teach his special way to other kids who have trouble tying theirs. He’ll start fourth grade in the fall and is excited to keep moving forward. He’s graduated from the Neuromotor Intensives program, but he’ll keep coming back to ChildServe for therapy and to visit his friends, Ashley and Christine. Hunter has accomplished many of his goals, but he has one left to conquer – he wants to work at ChildServe when he grows up. 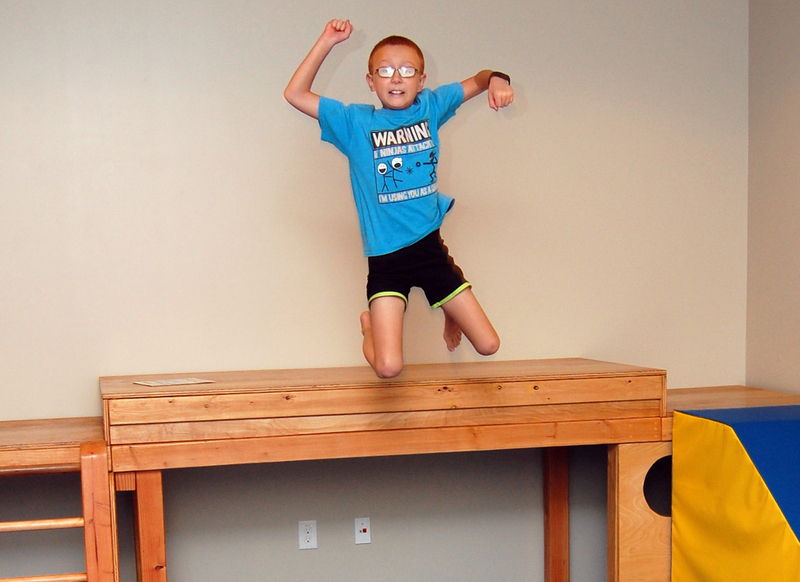 “He sees how his therapists help kids, and he says he wants to help kids too,” said Angie.